Reverse heart disease with a change of diet and lifestyle. Most people can reverse heart disease with a change of diet and lifestyle. Heart disease is the result of a diet rich in animal products. Cultures that have high consumption of animal products including dairy have the highest rates of heart disease while cultures that consume mostly grains, legumes, starches and vegetables do not suffer the fate of animal consuming cultures. The most comprehensive scientific study ever done of man and his diet, The China Study, found that when you consume more than 10% of your daily calorie intake in animal products, chronic diseases begin to surface. Dr. Colin Campbell, the author, discovered that excess animal protein caused a multitude of health problems that include cancer, cardiovascular problems, diabetes, weight problems and contribute to most all physical problems. We had a man in one of our classes that had two heart attacks about ten years prior to attending the class. He was overweight, sometimes suicidal and very withdrawn, on 15 prescription drugs, could hardly move about because of low blood pressure caused by medication, and he obviously looked very sick. He decided to change his lifestyle to reverse heart disease. he exclaimed he had not felt this good for 10 years. The last of his drugs was for ulcers that were caused by the other 14 drugs. He eliminated this ulcer drug after a short time with his new way of living. The cure for heart disease...meet Dr. Caldwell Esselstyn. Dr Caldwell Esselstyn and Dr. Dean Ornish have been two of the pioneers in the medical field to reverse heart disease with a change of diet. I prefer Dr. Esselstyn's approach because this lifestyle change does not require exercise and stress reduction to achieve results. Don't get me wrong, exercise and reducing stress will normally hasten change. However, most patients in Dr. Esselstyn's first group were so sick that they could not exercise any, yet great results were obtained. This is the proof that diet changes do work to reverse heart disease. Dr. Esselstyne says, "Heart disease is a paper tiger". Most heart disease sufferers can stop the disease from progressing and/or eliminate the disease completely by changing their diet. The miraculous self healing body will perform it's duty of returning to a state of good health when the correct fuel is placed in the tank. Not only does the body correct the heart problem but also most other ailments that you have. I highly recommend Dr. Esselstyn's book "Prevent and Reverse Heart Disease." Remember this one thing...prescription drugs and by-pass surgery do NOT stop the ravages of heart disease caused by a faulty diet. Pills and procedures only treat symptoms. Dr. Esselstyn states that he has never witnessed a heart event in anyone that maintains his recommended guidelines. These are your targets for good health. We have reviewed Dr. Esselstyn's heart healthy diet in our healthy diet plans. The review will give a more detailed overview of the lifestyle change required to stop and/or reverse heart disease caused by a poor diet. 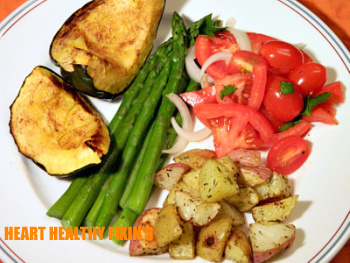 A return to vibrant health begins on the dinner plate!